Sometimes, too much technology can be a bad thing. Busy families struggle to coordinate schedules among all the devices they have using Microsoft Outlook, Web calendars and a multitude of apps. Yet, no single program unites all of these calendars in one place. This week, I tested something that attempts to do just that. I’ve been using Skedi, a $10 app for the iPhone and iPod touch made by Rodax Software. It imports third-party calendars, lets family members create activities to which they invite or delegate one another (or other people, like a baby sitter) and it syncs Skedi events back to other programs, like Google Calendar. The best feature of Skedi is that it displays family members’ availability, much like Microsoft Outlook, so a person can see when others are free or busy. As dreamy as this app sounds, it needs work. It’s only accessible on the iPhone and iPod touch and won’t work with Microsoft Outlook calendars. It also needs more adjustable settings. 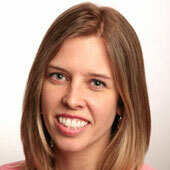 Future iterations will make it more accessible via other devices as well as the Web, according to Rodax. An Android app is planned for this year and an iPad app is expected this year or early 2012. Over the past two weeks, I’ve come to really appreciate the value of an app like Skedi. My husband has been at a conference in California and I’ve made several attempts to make plans with friends for when he returns. One by one, I’ve had to cancel a Friday night dinner, a Saturday night concert and an attempted Sunday night rescheduled dinner because I made the mistake of thinking that no news of plans meant he had no plans. Unfortunately, my husband couldn’t step away from the conference to test Skedi with me. (I tested it with a colleague.) This brings up another matter: Scheduling is a participation sport. The more people who use a scheduling app, the more useful it’ll be. Skedi gives different people different permissions. Kids aren’t required or even asked to respond to an event, which is fine for younger kids whose parents plan their schedules. (The term “parents” can be used loosely; a grandparent or friend can be added as a “parent.”) One prompt encouraged me to add a car in the “kid” section so it was automatically reserved for an activity. Left to right: The Skedi app lets you create an event, respond to the event and see when family is busy. To set up Skedi, I created an account using my email and a password, and then followed prompts to add other parents, kids, baby sitters and friends to the account using their names and emails. People who are invited to Skedi get an email with a link that walks them through setting up an account. But they’ll each have to buy the app for their devices if they want to use it. The Rodax Software website suggests using Apple’s workaround for this: signing into each device with the Apple ID originally used to buy the app, but this can be a pain. After adding people, I was prompted to add my calendars, though only calendars that follow an Internet standard called CalDAV will work. These include the Apple Calendar and MobileMe, Google Calendar, Yahoo and AOL. I added Google Calendar by entering my Google account email and password. In the final setup step, I told Skedi to use my Google Calendar as the default calendar for adding events. Once setup is complete, Skedi doesn’t let users add or remove people from accounts. Rodax’s president and founder, John Boyer, said that fixes over the next two weeks would enable making these and other changes to calendars. Skedi looks a lot like iCal on the iPhone, including “+” icons in the top of the screen that add events. 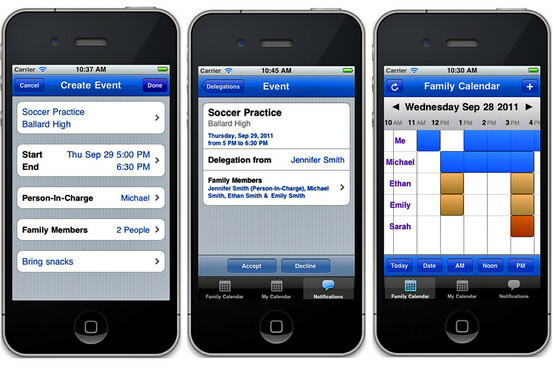 Skedi is divided into three sections: Family Calendar, My Calendar and Notifications. Family Calendar shows an overall view of each person in the account, and color-shading—blue for parents, tan for kids and brown for baby sitters—on calendar dates represents when people are busy. If someone in your Skedi account imports a calendar to his or her account, like her work calendar, appointments on that calendar are represented with the colored shading but are marked as Private. This lets family members know the times aren’t free but prevents them from seeing the details of that work calendar. I created events by giving them titles, adding a location, specifying the start and end times, designating a person in charge and selecting the people in my Skedi account who I wanted to join. Skedi checks each person’s availability so I know who’s busy or free. Even if a person is busy, Skedi still lets me add them to the event. The Notifications section tells you if someone has invited you to an event, delegated you in an event or canceled an event. Alas, these alerts are only accessible through the app, though Mr. Boyer said email alerts will be available in the next two weeks. Back at my computer, I opened Google Calendar on my Web browser and saw events other people in my account and I had added using Skedi. A “booked by Skedi” note beside each event clued me in on how these events were added. This is especially helpful for people who add events on the go and forget they did it. The current iteration of Skedi has too many kinks in it, and the app will be much more useful when it’s accessible by means other than the iPhone and iPod touch. Still, the idea of saving time by automatically showing family members’ availability is a big plus.